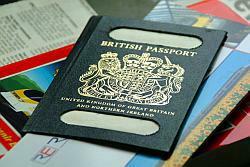 Passports will be stamped with a 30-day visa at passport control on arrival to North Cyprus. As most visitors on holiday will only require this as a maximum then you need not be concerned about overstaying. However, rules can change very quickly and you may find that a 60 or even 90 day visa stamp has been issued! It is worth asking for a longer visa at passport control if you intend to stay over 30 days as they can give a discretionary automatic extension. If you do intend to stay longer than your stamp allowance it is possible to visit one of the immigration departments which are located in the larger police stations in Lefkosa, Kyrenia or Famagusta. They have the authority to extend your stay. 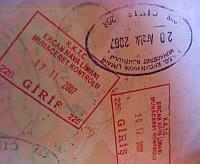 For children up to the age of 18 travelling to North Cyprus there is no time allowance restriction. Whilst it is completely unnecessary, as visa stamps for the TRNC in passports are not illegal in any other country, including Greece or south Cyprus, you may, depending on what you have heard, prefer to not have your passport stamped on arrival and departure. If this is the case then tell the official and they will provide you with a separate visa entry form which is then stamped and needs to be kept for your departure when it will be stamped again. If you intend to visit the south of the island during your stay, then again you will just need to produce either your existing visa paper if you did not want your passport stamped on arrival, or complete a new one at the checkpoint. You generally do not need to show your passport again in the south side unless you are specifically asked for it. The process is then repeated on your return. If you arrive into and depart from North Cyprus via the south from Larnaca or Paphos airports for example, then the above process is also applicable. However, should you arrive into North Cyprus but then leave via the south of the island, then you have effectively initially arrived via an ‘illegal’ port – according to the Greek Cypriots – and you may be in for a nasty shock as they will more than likely turn you back, so you need to enter and leave via the same location. It may sound strange for visitors, but this has happened before as people are sometimes unaware of the restrictions imposed by the Greek Cypriot authorities. You can get complete and up to date information from the offices of the Turkish Republic of Northern Cyprus in London, telephone +44 (0)207 631 1930, or from the Turkish Tourist Office, telephone +44 (0)207 629 7771. Should you wish to learn more about permits for working and living in North Cyprus, border crossings or Embassy and High Commissions located in Northern Cyprus, then please visit our Relocation, Border Crossings and Embassy sections. Hi Vilma, we believe that you would most likely get a 30 or 60 day visa stamp when entering North Cyprus. You don’t mention if you are going to visit for long? You would need to get it renewed but that is not a given! I’m a Philippine passport holder and I need to go to Northern Cyprus and stay for 10 days. Do I need to have a Visa from Turkey or I don’t need any visa? I really hope you can help me on this. Thanks! Hello everybody,i’m from south Cyprus(i belong to the catholic minority,my mum is German and my father Maltese but was born in Istanbul) .I was born in Nicosia and i’m planning to live with my filipina fiance in north Cyprus with my son(almost 2 years old and also a filipino citizen) can my fiance and son be allowed to live in north Cyprus with me?looking forward for your reply,thanks. Im an Iranian Passport Holder and Resident of the United Arab Emirates. I am willing to travel to Ercan with Turkish Airlines , will I be getting an on arrival visa or do I have request for a visa. im a filipino and i want to travel to north cyprus,do i need visa to go trnc?i hope you can help me. im planning to stay for 30 days,do i need a visa from my country?what are the requirements needed! i am filipina married a cypriot man,but am in philippines right now,do i need a visa to come there or i will show my married contract .pls.advise me. Im ordinary passport holders, im here in hong kong for work.and i really want to have a vacation in north turkey for 10 days,do i need visa requirements?! hello,sir i’m planning to visit the Cyprus one of my friend invite me to there what I’m going to do? My name is Kasim Umar from India. I want to know about the Northern Cyprus Visa requirements for Indians ? I want to come there on visit visa & migrate in to a Work Permit or Residence visa. I have completed my bachelors in Commerce and having 5 years of Experience as an Accountant. so can I get the job easily there or can I migrate in to a Work permit ? what is the procedure ? plz tell me. I am from Philippines married to American we are planning to come visit NORTH CYPRUS I do believe I don’t need a visa to visit there but I want to know what ducuments or anything that they will be asking me before I enter NORTH CYPRUS. I am working in TRNC with my husband we have a baby left in philippines age 1 year can we take her with as what are the requirements we are please to here a reply because we can’t find someone to look after her in our country its more better i think if she is with us. Hi I’m Edna, I am from Philippines, I want to visit my friend at Northern Cyprus and spend my holiday for 2 weeks.I want to know if I need visa going there? where i can I get visa here int the Philippines? I was wondering if canadian travel document holders who are permenant resident with expired iranian passport need to get prior visitor visa for northen cyprus or they can get an entry visa by the time they get to Ercan airport? I couldn’t find proper answer on different websites.